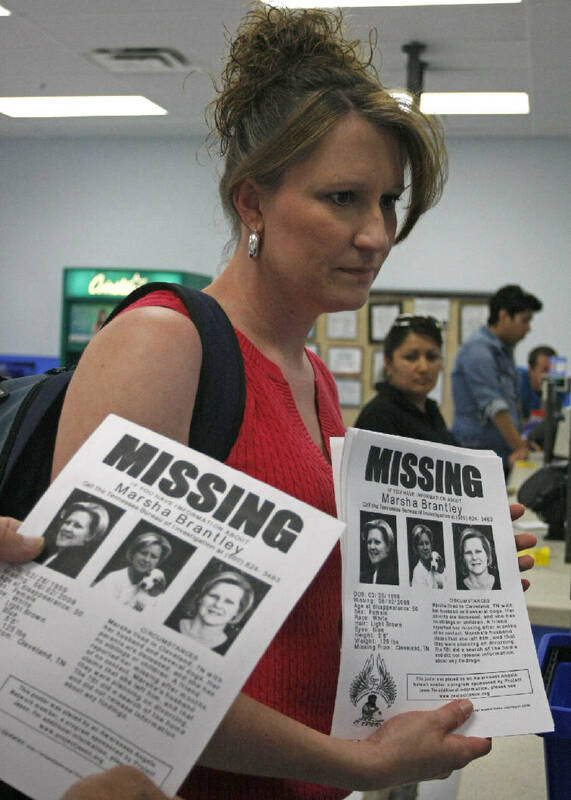 Missing woman's family searches for clues in Cleveland, Tenn.
Jana Wills, Marsha Brantley's cousin, shows a missing person flier to a Wal-Mart employee Monday in Cleveland, Tenn. She and other family members handed out missing person fliers in hopes that Brantley, who has been missing two years, will be found. Photo by Allison Carter /Times Free Press. CLEVELAND, Tenn. - Phyllis Dodd was working in her flower bed when she saw her neighbor shuffle down the street. 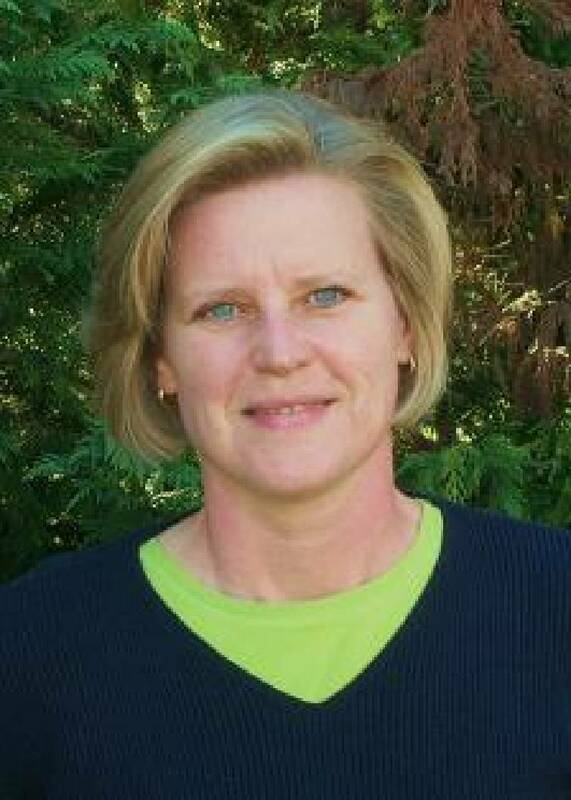 Dodd remembers turning to her husband and saying, "Marsha looks so sad." Two years later, Dodd plays that scene over and over in her head because it was one of the last times anyone saw Marsha Brantley in Cleveland. "I wished I had actually said something to her," Dodd said Monday, shaking her head. Brantley, 51, of Cleveland, hasn't been seen or heard from since June 2009. She had no children, no siblings and both her parents died within three weeks of each other in 2000, family members said. Dodd thinks something happened to Brantley, and she wants answers. On Monday afternoon, Dodd joined Brantley's aunts, uncles and cousin at the Bradley County Sheriff's Office to begin an effort to find clues about what happened. "We've never had anything on either side of our family this bad that ever happened," said Brantley's aunt, Janice Radar. Family members traveled from Morristown, Tenn., and Greenville, N.C., and went door to door at several Cleveland businesses Monday and handed out missing person fliers. Because Brantley wasn't especially close to any of her relatives, it was almost a year before her aunt, Medra Justis, who lives in North Carolina, found out through Facebook that her niece was missing. Justis contacted the Tennessee Bureau of Investigation, which has been conducting an investigation since December 2009. In the past couple of weeks, the Bradley County Sheriff's Office has been asked to join the investigation, the first time it has been involved. "I've never had to deal with anything like this," Justis said. Everything about her disappearance seems odd, her family and friends said. The house where Brantley and her husband, Donnie, lived in Cleveland was in her name, and her father had fixed it up before he died. Her three dogs, which she had rescued from the Humane Society, were left at the house, relatives say. The blog she posted to almost daily - Magpie's Nest - is untouched since May 2009. After Dodd realized that she hadn't seen Brantley in several weeks, she said she questioned Donnie Brantley. He said his wife had gone to visit friends out west and that they were getting a divorce, Dodd recalled. "That surprised me," she said, explaining she had never seen the couple fight or seem upset. Donnie Brantley also told investigators that his wife had left him and they were planning to divorce, TBI spokeswoman Kristin Helm said in a 2010 news release. There are no suspects in the case, although 10th Judicial Circuit District Attorney Steve Bebb called Donnie Brantley a "person of interest." Bebb declined to elaborate. Donnie Brantley couldn't be reached for comment, and his attorney, Joe Hoffer, didn't return calls seeking comment. Brantley's family just hopes the fliers will jog someone's memory and give the family some sense of closure. "Marsha has no defense on her side," Radar said.